As architects, we know that building your dream home is a huge financial (and time!) commitment. We have all heard cautionary tales of cost overruns and construction delays. Many homeowners begin custom home projects with excitement and enthusiasm but end them with frustration about a lengthy and overwhelming process. As architects, we can help. A common misstep that homeowners make is waiting too long to hire an architect. An architect is a start-to-finish resource—not just your designer or permit specialist, but your advocate, advisor, project coordinator, and guide as you turn your dream into reality. Starting your project with an architect will provide you with valuable insights and expertise that will save you money not only during construction but throughout the life of your building. How can an architect save you money? We analyze your constraints and highlight multiple ways to achieve your goals. Creative solutions come in all sizes and prices, and we ensure you have the information you need to choose which solution is right for you. For example, perhaps you think an addition is the solution to your needs, but you might just need to reallocate and reorganize the space you have. Architects can see the opportunities that might not be apparent to you, especially if you live in the home and are accustomed to its current patterns. This interior remodel reconfigured existing spaces to add function and daylight in key areas — without increasing square footage. Soft costs include services and fees relating to design and permitting. Design services aren’t free, but they are a relatively small percentage of construction cost (5-12% of most custom homes, depending on the services provided). Creative problem solving at the beginning of a project can add up to significant savings during construction and occupancy. Right-size your home so you are not overbuilding and overspending on space (and therefore labor and materials) you don’t need. Design for energy efficiency so your home is more affordable to heat and cool. Suggest unconventional strategies to achieve conventional goals. For example, we helped one client achieve a 20% cost savings on structural additions by choosing to lift up their existing house and build below it, rather than building on top of the existing structure. Learn more about this unconventional solution here. The existing home would have had to undergo significant structural alterations to support a new second story. 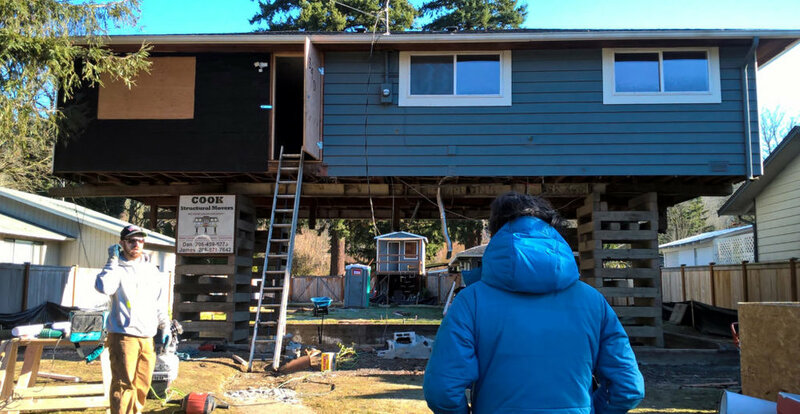 Lifting the existing home and building the addition beneath allowed for most of the existing structure to remain, and eliminated the need for a new roof! Buildings –like cars—cost more than their initial purchase price, or “first cost.” They need to operate effectively and efficiently for their entire life cycle. They need to be heated, cooled, illuminated, and ventilated. They need to draw and supply power and water for the various activities that take place inside. All of these systems can be designed to take advantage of natural resources on your site to save on long-term operations cost. Concerned with the cradle-to-grave life cycle of materials and processes? Then we can help you evaluate the environmental costs of your project life-cycle as well. Buildings are systems, not just an enclosure for stuff. All the parts of the system have an impact on operational cost, which is a significant factor in how affordable it will be to live in your house long-term. We consider the interdependency of many factors when designing for operational cost savings: the equipment and appliances you put into your home, the performance of the building envelope, and your preferences and behaviors as an occupant. For example, our Yakima Net Positive Project incorporates passive solar, geothermal, PV panels, super-insulated walls, and smart home integration. Learn more about these integrated systems here. Site-wide sustainable strategies provide the basis for long-term cost savings. This geothermal field was a key integrated system for this net-positive energy home. While every project presents a unique set of goals and constraints, there are many similarities we encounter from one project to the next. Our approach to every job includes evaluating where we can save time and money by drawing from proven solutions on past projects and where customization and innovation are the best way to address a new set of challenges. For example, Roy Farms is a family-owned Yakima Valley farm that has been in operation for more than 100 years. As part of their commitment to a sustainable future, they asked us to remodel an existing farm building to create a healthy and satisfying work space for their field employees. For remodels like this, customization can be an important strategy, where unusual conditions or constraints exist and energy and material efficiency are important goals. Learn more about the ways we upgraded this farm to meet their sustainability goals here. Custom wall and roof assemblies were key to reusing most of the existing structure while increasing energy efficiency. When you hire an architect, you get years of experience and insight focused on your needs. We are your advisor and advocate, and work to empower you to make decisions that support your goals. When we work with you from the beginning of your custom home project, we can make sure you get a home ideally suited to your needs. Our consistent involvement as your advocate from start-to-finish brings you a level of control throughout the process, so that you avoid the unhappy surprises of budget overruns and higher than expected maintenance costs. If you are in the early planning stages of a new construction or remodeling project and you’d like to discuss it with us, please fill out our Brief Online Questionnaire. If you are interested in a new custom home or home remodel and would like to have a more in-depth discussion of project priorities, site issues, and design goals, please contact us.